On Saturday 14 and Sunday 15 October, LAPP opened the doors of its Auditorium for a new kind of conference, during the fête de la Science 2017. Didier Verkindt, researcher at CNRS on Virgo experiment, presented during the fête de la Science an interactive conference entitled Esprit critique, es-tu là ? He described the key concepts of zététique and the basis of the scientific approach that can be used in the everyday life. The spectators of the conference then became actors to apply this approach to true and false scientific statements. 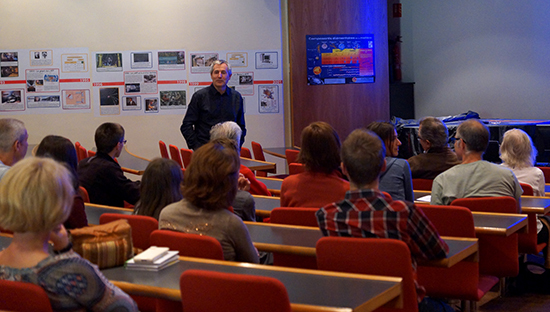 Didier Verkindt discussing with the public. Dihydrogen monoxide1 is the main greenhouse gas, is it harmful ? Can the Maya calendar explain the telluric magnetic currents, as a consequence of a vital electromagnetic field acting on the atmosphere ?2 These are some of the questions on which the public discussed in a friendly atmosphere. With 65 spectators for these two sessions, the conference was a good adventure for LAPP team and for the visitors. Everyone left the Auditorium looking at the world differently. 1 Better knowk as "water". 2 This sentence is formed with real scientific words in a way that is just a kind of "cosmic gibberish" with no meaning.